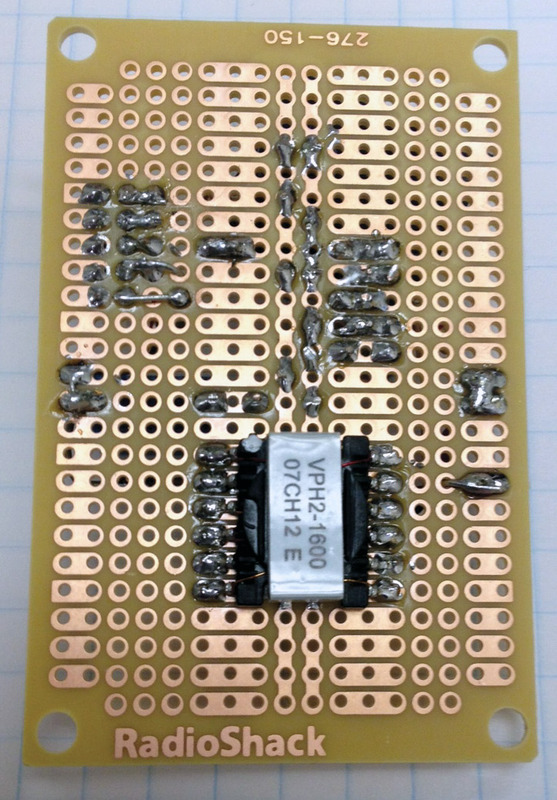 The tester described in this article is a simple two-transistor circuit operating from a 9V battery which tests zener diodes with breakdown voltages up to 52 volts. 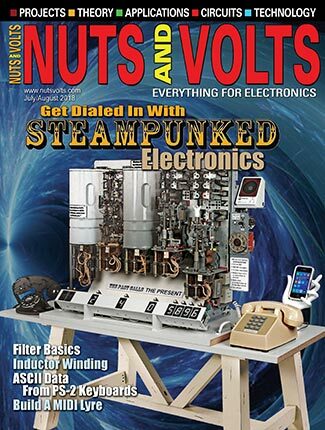 Nothing more than a multimeter is necessary to build, test, and use the circuit. Its transformer-coupled design adjusts the output voltage automatically to the voltage of the zener diode under test, while adjusting diode current to preserve a relatively constant diode power throughout the measurement range. 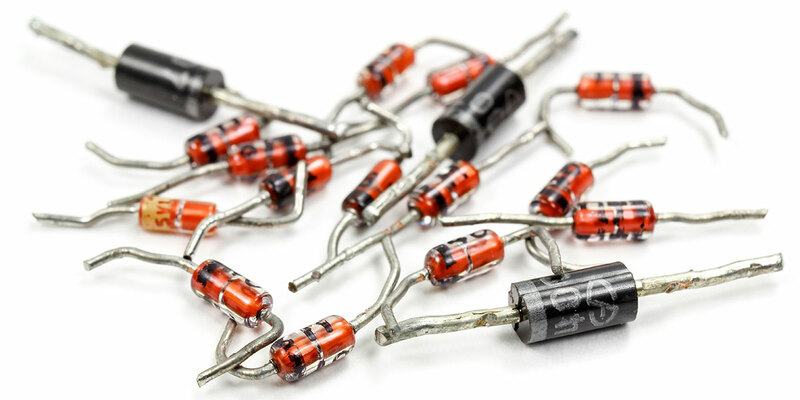 There’s no need to select a current-limiting resistor. Just connect a voltmeter across the diode and measure its breakdown voltage at a consistent and safe power level. The circuit will also safely test LEDs — including white LEDs that multimeters can’t test and other low voltage diodes in their forward direction, as well as MOVs (metal-oxide varistors) and other protective devices with higher voltage breakdowns. Connecting an external power supply to the tester allows devices that break down well above 50V to be tested easily, also. 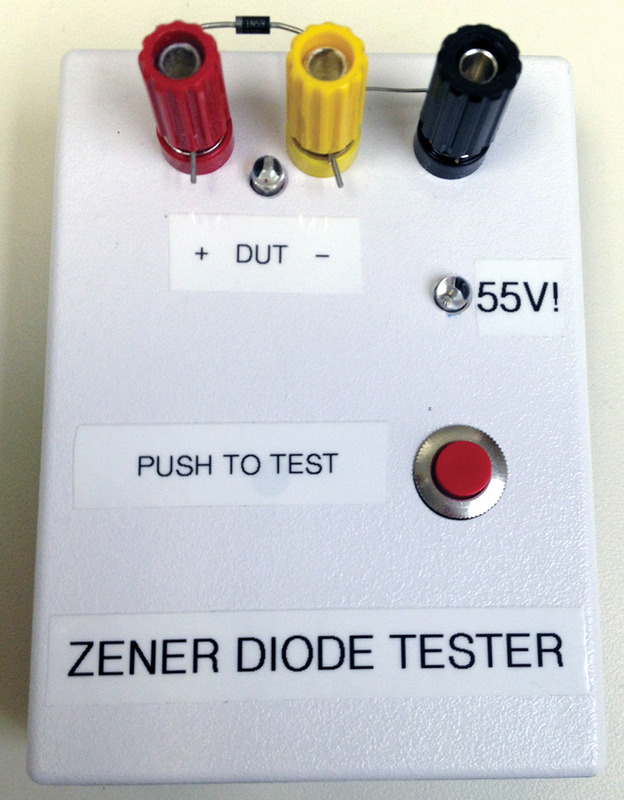 With all my projects and the numerous uncharacterized devices lying around my shop, this zener tester has proven to be the most regularly used equipment on my bench! If you’re not familiar with zener diodes, then an introduction is appropriate. Zeners are so useful they should be found in every experimenter’s component collection. The zener diode is a specialized silicon diode that looks like a normal silicon diode in the forward direction. However, in the reverse voltage direction, it exhibits a low leakage current like a normal diode until a voltage — the so-called “zener voltage” — is reached. At that point, it sharply exhibits a controlled constant breakdown voltage despite increasing current. All diodes start to heavily conduct at some voltage in the reverse direction, but are operated well below this breakdown voltage to avoid damage. Zeners, on the other hand, are designed to be operated in their breakdown region, and that breakdown is carefully engineered for specific voltages. For example, the 1N4728 to 1N4764 family of zener diodes includes breakdown voltages from 3.3 volts to 100 volts in 37 steps — a much broader range than common fixed-voltage three-terminal IC regulators. These diodes can also be put in series to achieve almost any voltage desired, and different diode families come in various wattage ratings from 200 mW to over 10W. Zeners are commonly used as voltage regulators, reference-voltage standards for op-amp designs, and as protection devices to safeguard components from over-voltage conditions. Applications like relay or solenoid drivers and switching power supplies — like the one described in this article — commonly use zeners for protection (like D2 in Figure 1). They also find use (instead of a simple series resistor) in dropping one voltage down to a lower voltage, and in clipping AC voltage waveforms. 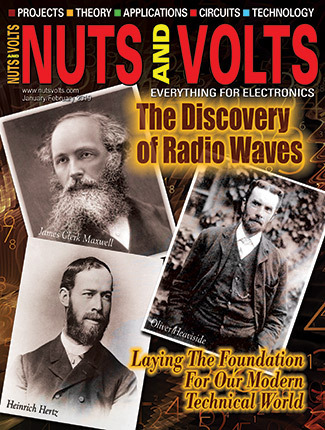 They are even used as noise generators in RF impedance bridges. 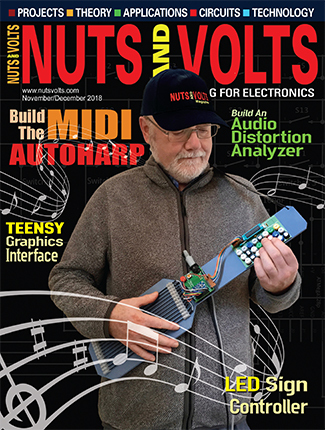 Best of all — particularly for experimenters on a budget — typical low power zener diodes cost just pennies each. 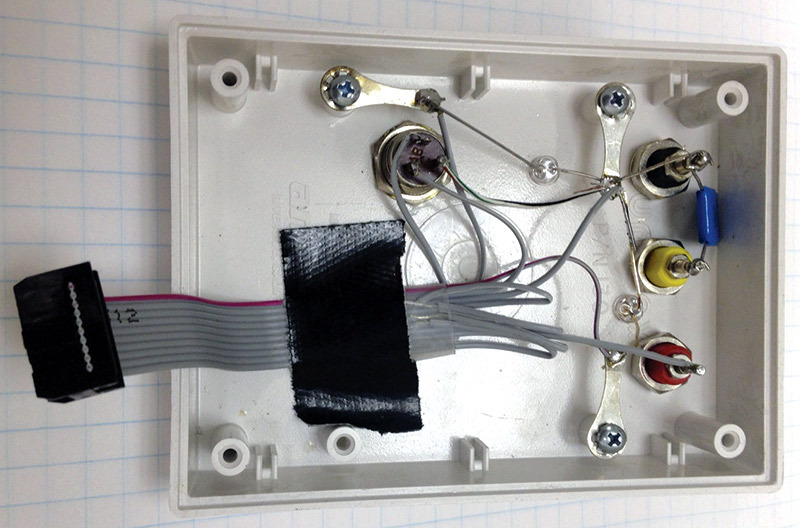 The diode to be tested is connected between the red and yellow terminals, and the voltage is read across these terminals when the pushbutton is depressed to test. 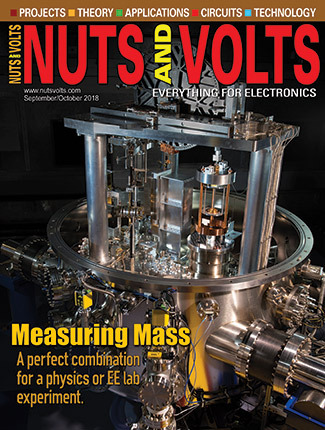 Connecting a current meter between the yellow and black terminals allows current measurement while testing if desired, or replacing the current meter with an external power supply allows extending the tester’s range to well above 52 volts. A flashing red LED indicates when voltage is present across the test terminals. A yellow LED indicates that the output is at the limit of 55V. When no diode is present or the zener diode has a breakdown voltage above 55V, this LED is illuminated. The LED also indicates correct functioning of the internal circuit for initial testing and serves as a safety reminder that a potentially dangerous voltage is present across the output terminals. When the test switch is released, the output is quickly discharged to zero volts for safety. The internal circuitry of the tester is easily modified and simulated to change the voltage range or for use in other applications. These modifications and simulation are discussed later in this article. The schematic of the tester is shown in Figure 1. The key to operation and building ease is the use of a transformer, T1, which is readily available from multiple distributors and designed for use in small switching power supplies. T1 has six independent and identical polarized windings of which four are used in the tester: T1-L1 is the “primary” driving the “feedback” winding, T1-L4, and storing energy in the transformer’s magnetic field; then T1-L2 and T1-L3 are connected in series to form the “secondary,” discharging the stored magnetic energy into the diode under test (DUT). Some of you will recognize this basic circuit as a simple “blocking oscillator,” widely used with vacuum tubes for radar applications in WWII, and later adopted as a transistor configuration for the earliest generation of solid-state switching power supplies. In the power supply realm, it’s now termed a “flyback” circuit, harking back to CRT-based/TV horizontal-output circuits using this topology, or often referred to as a “boost” circuit. 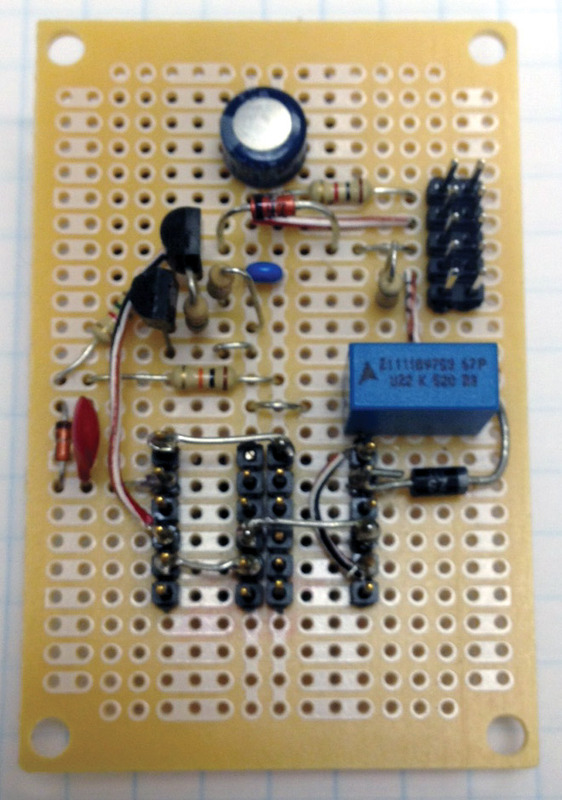 It’s simple, works with many different transistors, and doesn’t require specialized integrated circuits. S1 is an SPDT momentary pushbutton switch. Until S1 is pushed, the 9V battery is disconnected from the circuit, and output filter capacitor, C4, is discharged through R8. Pushing S1 to the ON or TEST position removes R8 from the output, and applies 9V to the primary, T1-L1, and to the start-up resistor, R2. It also turns on LED1 — a flashing red LED that indicates to the user that the circuit is energized and there are potentially dangerous voltages across the output terminals. Steady-state oscillation waveforms are diagrammed in Figure 2. FIGURE 2. Timing diagram showing transformer voltages. 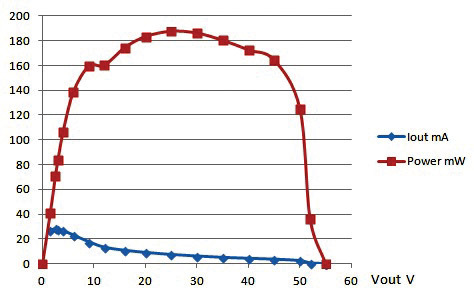 Voltage levels (referenced to ground) are shown for a generalized zener diode voltage, Vz, under test. The voltages shown in parentheses are for a 12V zener diode as the DUT, and corresponding actual circuit waveforms are shown in Figure 3. FIGURE 3. 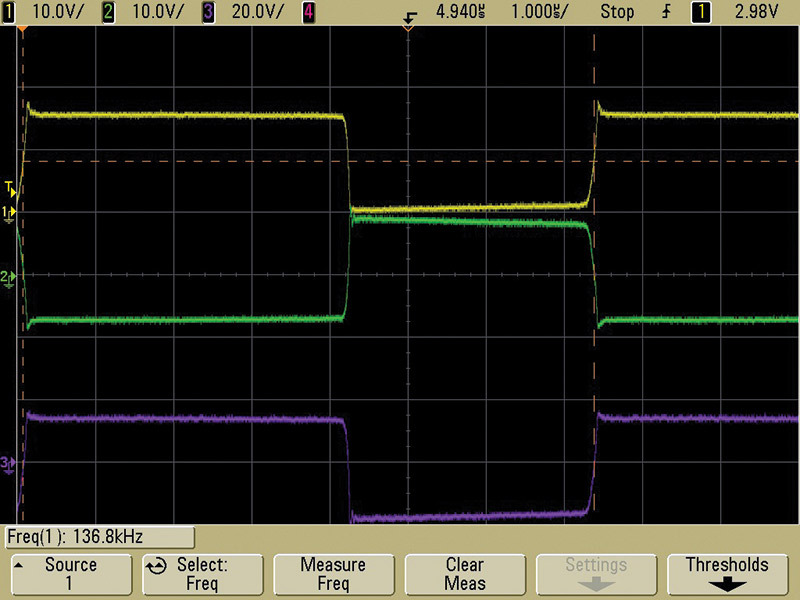 Oscilloscope capture of actual circuit testing a 12V zener. If no DUT is present when the circuit is operating, then the voltage across C4 will continue to rise, as will the peak voltage at the collector of Q1. The voltage at pin 2 of T1 and the output voltage would keep rising with each cycle, as would the peak voltage (half the output voltage plus 9V) at the collector of Q1. This is a feature of a flyback circuit configuration, which allows zener diodes to be tested well above the battery voltage of 9V. 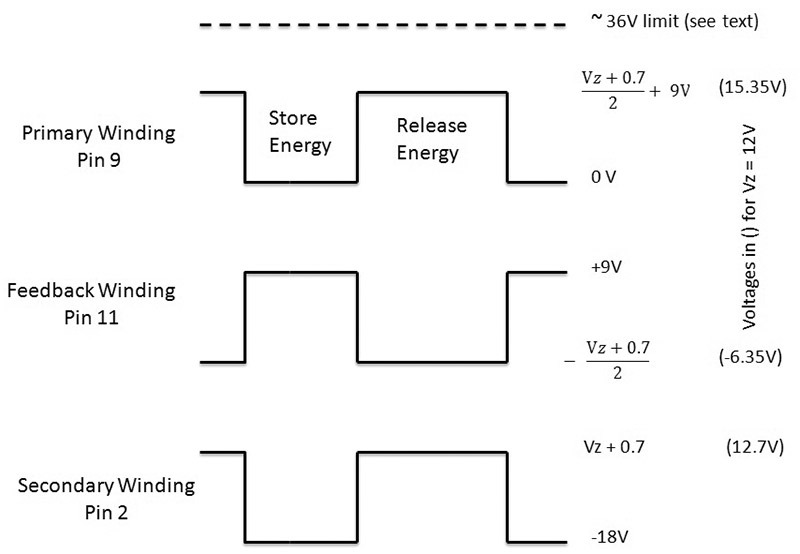 Figure 4 shows actual measurements of current and power for various DUTs on the tester as constructed. Measurement of these diodes with a direct current supply and the same currents produced identical results, so measurement accuracy is excellent. It should be noted that the transformer inductance tolerance is ±30%, so your results may differ. FIGURE 4. Measured output power and current. 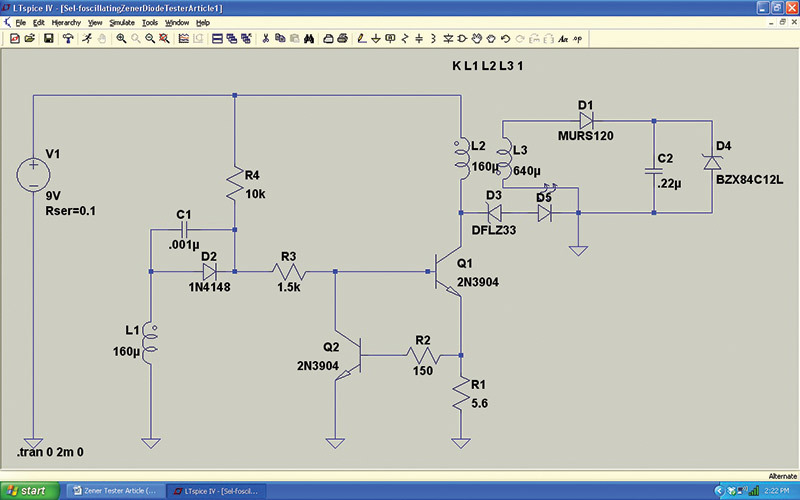 The free analog simulator from Linear Technologies — LTspice® (www.linear.com/designtools/software) — is ideal for simulating this circuit and examining its detailed operation under varying component values and conditions. The simulator has virtual instrumentation that enables measurement of voltage, current, and power in every wire and component as a function of time. Only components that strongly affect circuit behavior need to be modeled. The model circuit is shown in Figure 5 with a 12V zener diode as the DUT. FIGURE 5. Schematic for LTspice. This file is available at the article link. A simulation screenshot showing output voltage waveforms from the output of the secondary winding (at connection to D1) is shown in Figure 6. FIGURE 6. 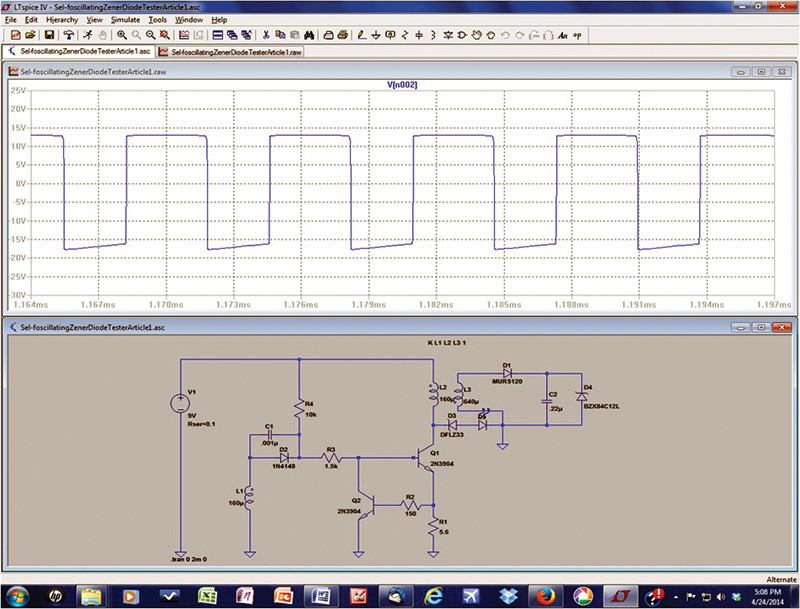 LTspice simulation — transformer output waveform. Components in the LTspice library were used, which differed in some cases from the actual components on the schematic. The transformer is modeled as a set of coupled windings with 100% coupling (K=1 in the Spice Directive for the transformer), and all inductances are assumed to linear without any current dependency. The actual transformer used specifies a 30% inductance decline at a current of 420 mA through a single winding — well in excess of the peak current in this design — so the assumption of linearity is reasonable. Simulated circuit behavior was very close to real circuit results and was particularly useful to optimize component values. FIGURE 7. Top of assembled PCB. FIGURE 8. Bottom of assembled PCB. I used pin headers for the contacts to T1 and to connect to the front panel via a flat cable (10-conductor) with a connector to the PCB (Figure 9). Neither is necessary, although I find pin headers convenient for securing oscilloscope probes when evaluating the circuit. FIGURE 9. Inside of enclosure top. Short the yellow to the black terminal with a jumper, connect a zener diode across the red and yellow terminals (banded side to the red terminal) along with a voltmeter, and read the voltage across the diode after pressing S1. You’ll note that as you hold S1 down, the zener voltage will drift up as the diode heats, so make a quick measurement. Testing of LEDs and other low voltage diodes is also possible; just make sure the positive end of the LED or diode is connected to the red terminal to measure the forward voltage drop. Otherwise, the high voltage potential of the tester could destroy the LED or diode by exceeding its maximum reverse breakdown specification. If you want to measure the current through a zener diode, remove the jumper between the yellow and black terminals and insert a millimeter. Capacitor C5 across these terminals provides a low impedance path to the pulsing current through the DUT so that the lead inductance of the multimeter doesn’t affect the readout accuracy. If you want to increase or decrease the power delivered to the DUT, then decrease or increase the value of R6, respectively. 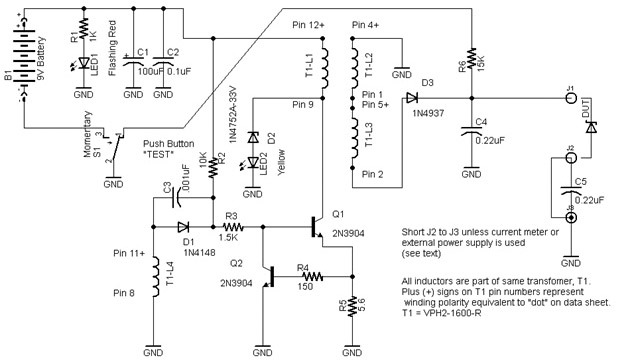 Both 2N4401 and MPSA06 transistors can support peak currents up to 500 mA and are usable in this circuit. Switchmode Power Supply Handbook, Keith Billings, McGraw-Hill, 1989, pp. 2.49 to 2.62. Part list updated. Download zip file for updated Parts List.